Slightly chewy, slightly crunchy and totally delicious, these Cranberry Noels Cookies are a wonderful holiday cookie, perfect for a snack, after dinner dessert or as a welcome addition to a holiday cookie tray. • Cream together butter and sugar for 3 minutes. • Add milk, rum flavoring and salt; beat to combine. • Gradually add sifted flour; combine. • Add cranberries and pecans, beat just enough to combine. • Form two logs of dough, 8″ long and 2″ in diameter, and roll in coconut. • Wrap each log with plastic wrap, and chill 2 hours. • After 2 hours, preheat oven to 350°. • Remove dough from the refrigerator, unwrap and slice cookies 1/4″ thick. • Bake for 12 minutes until edges are brown. 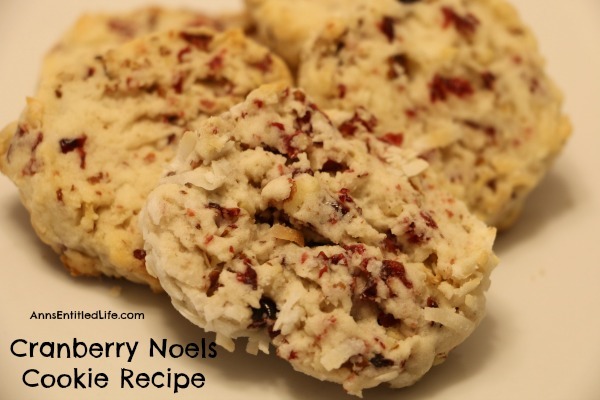 To print the Cranberry Noels Cookie Recipe , click here. Today is day 10 of 15 Days of Holiday Sweets! 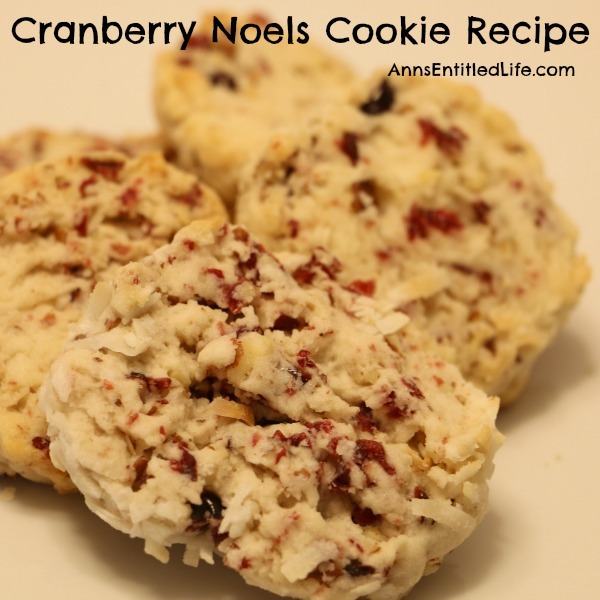 This Cranberry Noels Cookie Recipe is courtesy of my brother… well, actually his girlfriend (now wife!). My brother, his kids, and his girlfriend got together and made six different kinds of cookies for the holidays. This was one of the recipes I asked for to share with all of you. 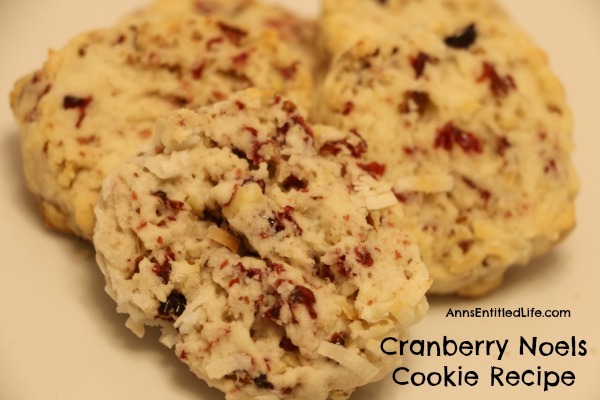 I have to confess: Hubby and I do not like cranberry cookies as a rule. These are excellent! We both liked them very much. The cranberry isn’t overwhelming, it just adds a touch of sweetness. This recipe lists flour in the ingredients, and then a flour and nutmeg mixture in the directions. Also, no mention of eggs. This recipe is from my brother’s SO. She listed no eggs.